The Conservative Animal Welfare Foundation was established in 2016. The Conservative Animal Welfare Foundation was established in 2016 to raise awareness on the lives of billions of animals reared on intensive farms around the world and how this impacts upon animal welfare, the environment and people’s health. We want to highlight the action people can take to help advance farm animal welfare. We believe it’s highly important that the welfare of farm animals is placed at the forefront of the Governments plan for food and farming along with its focus on productivity, competitiveness and technology. 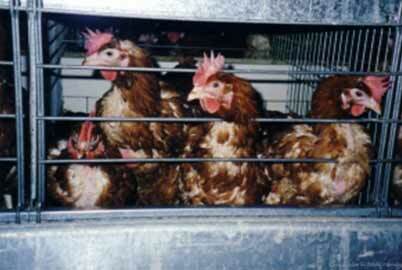 Each year around 70 billion animals are farmed for meat, milk and eggs worldwide. (2.3 billion in the EU) with about 25,000 slaughtered every minute. The conditions under which the animals are raised, vary significantly. UK welfare standards are amongst the highest in the world but standards elsewhere may be lower, leading to significant unnecessary pain and suffering for millions of sentient beings. We believe that Animal Sentience should be enshrined in UK law when we leave the EU. Brexit provides us with many opportunities to help advance animal welfare, including banning live exports for slaughter and fattening, banning foie gras imports and fur imports from fur farms. The UK banned fur farms years ago but we still continue to import fur from fur farms. It is vital that we do not lower existing standards when we leave the EU in order to secure trade deals with other countries which have lower animal welfare standards than the UK. Its important that we protect our Farmers from lower welfare imports. This will also help UK producers compete on a more level playing field and ensure there will not be a race to the bottom. British farmers face competition from many countries, some of which have lower animal welfare standards than those applied in the UK. For example, European producers are undercutting British pig farmers who command a premium for higher welfare standards yet British pig farmers now produce only 40% of the pork eaten in the UK. The remaining 60% comes largely from EU member states such as Denmark, Germany and the Netherlands. Neil Parish, chairman of the Commons Environment, Food and Rural Affairs select committee, in October 2015 accused the European Commission of “prevaricating” and giving European farmers an “unfair advantage” by allowing them to flout an EU ban on ‘sow stalls’. 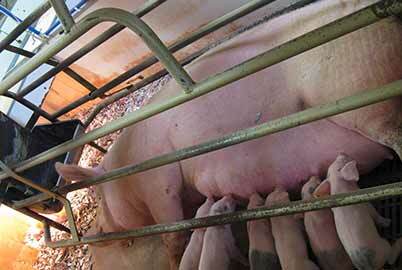 The stalls, which keep sows caged so they cannot move during their pregnancy, can cut farmers’ costs but were banned for cruelty reasons in the UK in 1999 and in the rest of the EU from the start of 2013. But more than several years on, six EU countries are still officially non-compliant. The Telegraph reported that Dr Joyce D’Silva, ambassador for campaign group Compassion in World Farming, said it believed the countries failing to comply were France, Belgium, Cyprus, Greece, Finland and Slovenia. 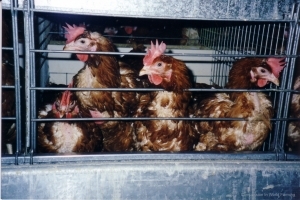 British farmers stopped using the cages or sow stalls in 1999 because they were so small the huge animals did not even have enough room to turn around. This system has been recognised as cruel for many years, not least because pigs are highly intelligent creatures and are denied any semblance of a natural existence. All farm animals processed for our food are individuals with their own individual personalities. None of us would deny that our pet animals have unique personalities, feelings and feel fear and pain. Farm animals in intensive farms are crammed together in sheds and are de-beaked, castrated, tails docked, de- horned and have their teeth clipped, artificially inseminated and their mating is controlled. The animals not only endure these painful procedures but also suffer from fear and stress. The fact that animals can suffer psychologically is acknowledged by European Union law which recognizes farm animals as sentient beings, as having the capacity to suffer. Intensively reared farm animals are controlled in every aspect and denied their natural behaviour to form bonds with their young and with each other. They have little space to move around and never smell fresh air or feel a blade of grass beneath their feet. Factory farms continuously breed, rear and slaughter the animals as quickly as possible to satisfy the relentless consumer demand for cheap meat. 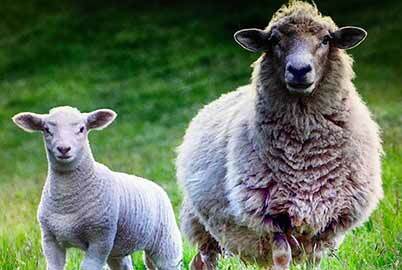 In 2013, more than 989.6 million farmed animals were slaughtered for meat in the UK, according to official figures. Of these, 2.6 million were cattle, 10.3 million pigs, 14.5 million sheep, 17.5 million turkeys and nearly 945 million chickens. Massive numbers of animals live their lives on intensive farms and this is of great concern to anyone with an interest in animal welfare. The truth is that while progress is being made, we could be doing a lot more to eliminate animal cruelty and improve animal welfare. There is increasing concern amongst the public of the rise in factory farms where animals are crammed together, where sow pigs are locked into farrowing crates, where cows never see a blade of grass and chickens are crippled with no room to move with little quality of life and well being. The media have reported on the costs to human health by the cramming of animals close together which encourages the spread of salmonella and E. coli. The use of anti-biotics in intensive farming is contributing to the development of drug -resistant bacteria. Indeed, Conservative MP Zac Goldsmith has consistently spoken out of the increase in anti-biotic use on farms. The Natural Capital Committee’s third report points out that “farming can produce large external costs to society in the form of greenhouse gas emissions, water pollution, habitat destruction, soil erosion and flooding”. It estimates these costs to society are as high as £700m per year. International leaders recently met at The climate summit in Paris to discuss the world’s Greenhouse Gas (GHG) emissions and agree on action aimed at limiting the rise in global temperatures to less than 2°C. Livestock production, fueled by factory farming, is responsible for more greenhouse gas emissions than all the world’s planes, trains and cars put together yet there was little focus on this. Industrial livestock production generally uses and pollutes more ground- and surface-water than grazing or mixed systems. The Conservative Government banned the use of veal crates in the UK in 1990. Veal crates are now outlawed in all countries in the EU. Conservative MP Henry Smith( our Patron), the Chairman of the Associate Parliamentary Group for Animal Welfare was at the forefront of securing CCTV in slaughterhouses to help lessen the suffering of farm animals. We are proud that we played an active part in campaigning daily for this important measure to be introduced in legislation. Philip Hollingbone MP led the Westminster Hall debate in 2015 to end slaughter without pre stunning which was well attended by MPs. Neil Parish MP, the Chairman of the Environment has also called for an end to the long distance live transportation of animals. Zac Goldsmith MP has repeatedly flagged up the overuse of antibiotics in livestock is causing resistance to life-saving drugs in animals and humans. Sir Roger Gale MP Sir David Amess MP have urged for an end to live animal exports for decades. 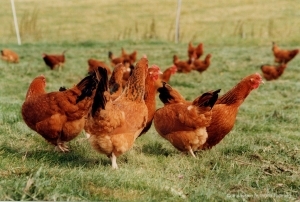 But Progress is frustratingly slow, look how the implementation of legislation to ban beak-trimming of commercial hens by 1 January 2011 has been constantly postponed. As people and individuals – we have the power to change our habits and our perspectives and look to our own diets and take responsibility for the way our food is produced if we want to see change in animal welfare. We can help to make a huge difference by the way we make our choices. We can all make a difference. There is increasing consumer demand for plant based diets. If you do eat meat -eat higher welfare. Higher welfare animal products cause less animal suffering. Buying them will encourage investment in higher welfare farming which is smaller scale and poses fewer risks to animals, people and the planet. Animal welfare should be at the core of our food choice. We can decide not to purchase factory farmed meat, poultry, milk, eggs and buy products from farms with high animal welfare conditions, where animals are reared free range and cage free and cows on pastures. As demand for livestock products continues to surge, particularly in developing countries, the importance of ethically sourced food becomes more important than ever as more animals are farmed. 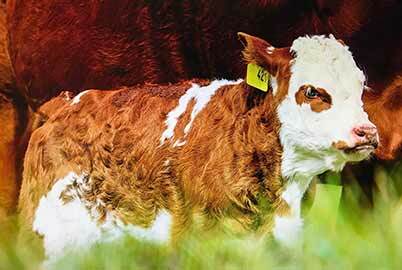 We want a kinder future for future generations which extends to the billions of animals reared for consumption. We care about the environment and the ethical treatment of animals.